The breadcrumb links we’ll be creating are styled with chevron shapes to support the idea of drilled down content. Previously a background PNG image would be used to create this chevron shape, but with the help of clever border techniques the same effect can be created purely with CSS. We’ll begin by quickly fleshing out the breadcrumb navigation links as an unordered list. Each breadcrumb link will appear as an <li> with a nested anchor element. The initial CSS code styles up each list item anchor as a neat blue rectangle. The text is positioned centrally within the space and equal padding is added to either side. In order to position elements absolutely later, position: relative; is added so those absolutely positioned objects will display relative to this parent element. We’ll now recreate the chevron effect in CSS that would previously only be achievable with a background image. Use the :after selector to create an extra element that can be styled up individually. The triangle shape is generated through the use of various CSS borders, so as you can see in the initial demo a single blue triangle can be created by applying top and bottom borders to intersect the overlap. These are currently coloured red for demonstration, but making these transparent will produce a single blue triangle. This border effect is then moved into place through absolute positioning. The border effect with the correct colour values will produce the desired triangle which gives the breadcrumb link the popular chevron shape. 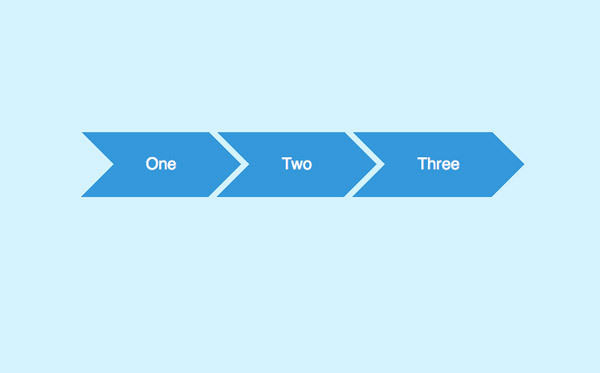 Using the same principle another triangle shape can be applied to the left of the breadcrumb link. This time the border colour is set the same as the page background to disguise parts of the blue link background colour. This additional triangle before the link affects the appearance of the text, but a simple padding adjustment will quickly rectify its appearance. As more links are added to the HTML the series of breadcrumbs increases, each separated by the cool chevron shape thanks to the CSS border triangle effect and a touch of right margin. 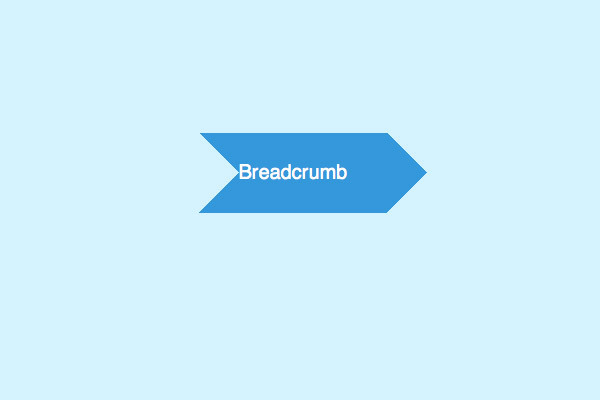 The full breadcrumb navigation list can be further styled by removing the triangle effect on the first and last items with the help of the :first-child and :last-child selectors, then given subtle rounded corners with border-radius. All that’s left is to apply a hover effect to the links. Don’t forget to change the border-left-color on the hover state of the triangle effect so the whole breadcrumb link changes colour. Height is 50px, why is the border value 40px? Finally got the clear explanation of every line of code and why and how it’s working.. Thanks Admin.. Thanks for the great tutorial line25. 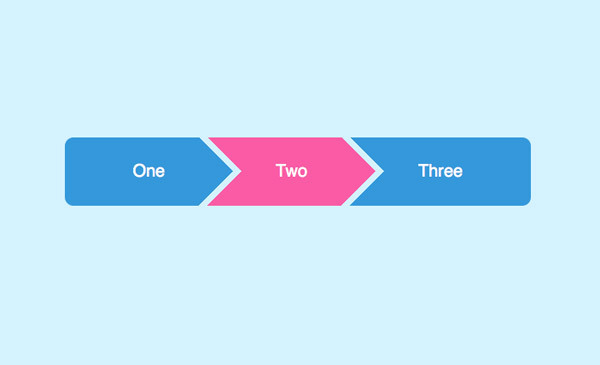 This post is very useful to create Flat Style Breadcrumb links with Css. How can i add a Active Nav class on only one link? Looks very cool design for breadcrumbs. I will try this one to blogspot. Very usefull post for website designers. I need to create a border for the chevron. Haven’t been able to achieve this. When using this approach, the inclusion of the ‘disabled’ class appears to stack and I’m having difficulty establishing why. Any thoughts? The example CSS is “as is”. The first 3 nodes are active, the last two are disabled. Nowadays, people would like to have flat style breadcrumb on their websites in order to attract website visitors. Great one, just implemented it. I like this a lot…thanks for taking the time to write this up! Looks great. Thanks for the great tutorial. All the instructions are well written. This post could be probably benefits for all of us. Great one, just implemented it. Thanks for that! Thanks for the tutorial, can’t wait to try it out. Thanks for the tips I would like to know how to reduce the size of all the objects and getting the text middle of each rectangle. Another great tutorial Chris, breadcrumb flat style is really awesome. Thanks a lot for sharing this, it’s simple and easy to follow. Amazing tuto, as always. Thank you very much, Chris! um… any reason why my comment got removed? Thanks Donto, that worked perfectly! Thank you, Donto! I fall in the same problem. I am having a problem where the :after element tips are hidden behind the :before elements. It is almost like the layering order needs to be reversed somehow. Can anyone help, it sounds like the same problem HenriD is having? Superb tutorial.. Its help me! I now have it inline but its missing the tip of the button? tried this but the navigation tabs are not aligning to the top of the page and instead cascades down like a row of steps? Looks great and your step-by-step instructions are excellent. Its really awesome for upcoming peoples and great efforts. I tried something similar to this once, but couldn’t figure out how to compensate for the offset difference in Firefox and Chrome. Your demo appears to have the same issue. When viewing the demo in firefox, the triangles are offset by 1 pixel. How embarrassing, my browser wasn’t zoomed at 100% but was 1 click off, that created the offset in firefox. Your demo appears to be working fine now.